In looking at NASA images of Mars a few years ago, Brown University geologist Peter Schultz noticed sets of strange bright streaks emanating from a few large-impact craters on the planet's surface. The streaks are odd in that they extend much farther from the craters than normal ejecta patterns, and they are only visible in thermal infrared images taken during the Martian night. Using geological observation, laboratory impact experiments and computer modeling, Schultz and Brown graduate student Stephanie Quintana have offered a new explanation for how those streaks were formed. They show that tornado-like wind vortices—generated by crater-forming impacts and swirling at 500 miles per hour or more—scoured the surface and blasted away dust and small rocks to expose the blockier surfaces beneath. "This would be like an F8 tornado sweeping across the surface," Schultz said. "These are winds on Mars that will never be seen again unless another impact." Schultz says he first saw the streaks during one of his "tours of Mars." In his downtime between projects, he pulls up random images from NASA's orbital spacecraft just to see if he might spot something interesting. In this case, he was looking at infrared images taken during the Martian nighttime by the THEMIS instrument, which flies aboard the Mars Odyssey orbiter. "You couldn't see these things at all in visible wavelength images, but in the nighttime infrared they're very bright," Schultz said. "Brightness in the infrared indicates blocky surfaces, which retain more heat than surfaces covered by powder and debris. That tells us that something came along and scoured those surfaces bare." And Schultz had an idea what that something might be. He has been studying impacts and impact processes for years using NASA's Vertical Gun Range, a high-powered cannon that can fire projectiles at speeds up to 15,000 miles per hour. "We had been seeing some things in experiments we thought might cause these streaks," he said. When an asteroid or other body strikes a planet at high speed, tons of material from both the impactor and the target surface are instantly vaporized. Schultz's experiments showed that vapor plumes travel outward from an impact point, just above the impact surface, at incredible speeds. Scaling laboratory impacts to the size of those on Mars, a vapor plume's speed would be supersonic. And it would interact with the Martian atmosphere to generate powerful winds. The plume and its associated winds on their own didn't cause the strange streaks, however. The plumes generally travel just above the surface, which prevents the kind of deep scouring seen in the streaked areas. But Schultz and Quintana showed that when the plume strikes a raised surface feature, it disturbs the flow and causes powerful tornadic vortices to form and drop to the surface. And those vortices, the researchers say, are responsible for scouring the narrow streaks. "Where these vortices encounter the surface, they sweep away the small particles that sit loose on the surface, exposing the bigger blocky material underneath, and that's what gives us these streaks," Schultz said. 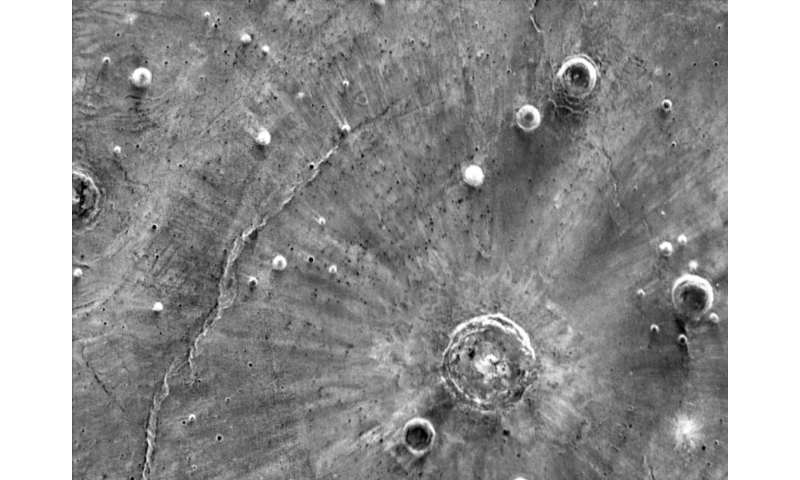 "We know these formed at the same time as these large craters, and we can date the age of the craters," Schultz said. "So now we have a template for looking at erosion." But with more research, the streaks could eventually reveal much more than that. From a preliminary survey of the planet, the researchers say the streaks appear to form around craters in the ballpark of 20 kilometers across. But they don't appear in all such craters. Why they form in some places and not others could provide information about the Martian surface at the time of the impact. The researchers' experiments reveal that the presence of volatile compounds—a thick layer of water ice on the surface or subsurface, for example—affect the amount the vapor that rushes out from an impact. 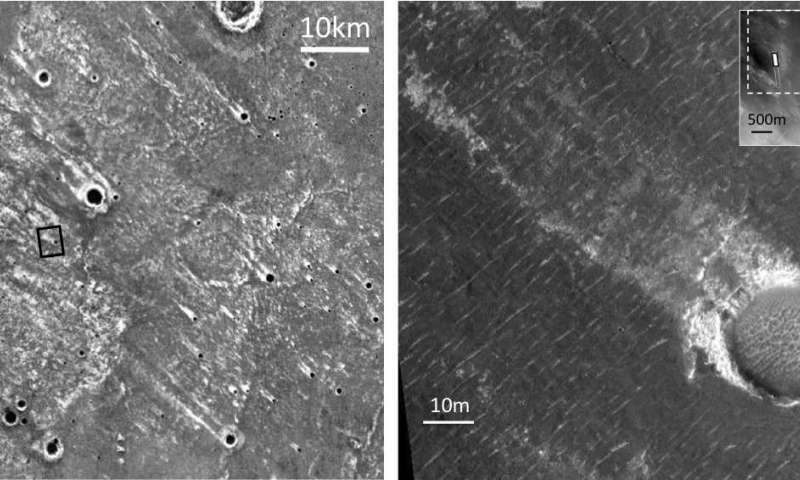 So in that way, the streaks might serve as indicators of whether ice may have been present at the time of an impact, which could lend insight into reconstructions of past climate on Mars. Equally possible, the streaks could be related to the composition of the impactor, such as rare collisions by high-volatile objects, such as comets. "The next step is to really dig into the conditions that cause the streaks," Schultz said. "They may have a lot to tell us, so stay tuned." Even more evidence of electric discharges creating some of these features. Although they would like to blame everything on gravity based phenomena here is a clear example that these efforts are just ad hoc guesses to explain away what is obviously beyond the realm of possibility. Then please, show the math proving how much energy is needed in your electric discharge to create a crater 20.5km across! Did the surface of the planet discharge? If so, what caused the huge energy buildup and where did it discharge to? Or was the surface discharged upon by an external body/source? if so, where did that energy come from, and why was this spot on the surface the target? So many questions I expect no answer to!